Shop Adjusted in our Pro Shop. Buy Now - Easy Pay 3! Marinelli VT-1419 Violin Outfit Description: Specs: Hand-Carved Solid Spruce Top, Maple Back,Sides and Scroll, Maple Bridge, Alloy Tailpiece w Built-In Fine Tuners, Ebony Pegs, Fingerboard and Chinrest. Shop Setup and Adjusted with D'Addario Prelude Strings. Accessories: Violin, Violin Case, Violin Bow and Rosin. 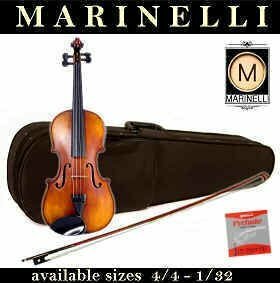 The Marinelli VT-1419 Student Violin offers one of the best values in a quality student violin to be found anywhere. Shop setup with quality D'Addario Strings and Ready to Play on arrival. Shop Violins from the MusicRentalCentral.com Violin store. Adult and children violins in all sizes. Buy Now, EZ-3 Payment Plan or Rent-To-Own. We can ship your violin anywhere in the USA! Order Online Now. Click Here to Play a Violin Sound Sample.